Scholarly efforts to record the popular culture of the past began in the eighteenth century as the final stage in a process of separation between elite or educated culture and those forms of expression produced by and for the people. The best-known part of this process was the collecting of folk ballads by antiquarians. Interest in ‘low’ cultural forms in this period also went hand-in-hand with a re-evaluation of Shakespeare and the Elizabethan drama, so what had previously been thought of as impressive but barbaric was now felt to have been touched with the genius of nature. But as far as the drama was concerned, the line had to be drawn somewhere, and it was definitely drawn at a point above the lowest of low theatrical forms, the ‘jig’. Although the performance of a jig was part of an afternoon’s entertainment at the English public theatres in the late sixteenth and seventeenth centuries (and has been revived in a reduced version at the modern Globe Theatre), it has largely disappeared from the public perception of early modern English drama and is known to scholars mainly from C. R. Baskervill’s study The Elizabethan Jig (1929). This will certainly change with the appearance of Roger Clegg and Lucie Skeaping’s wonderful collection of nine English jigs, which are presented here with a substantial historical introduction, accompanying music alongside the texts themselves, and finally a detailed explanation of how the jigs were staged, covering text, music, and dance moves. The edition ends with an appendix on dance instruction by Anne Daye. Both principal editors have long been engaged in the recovery of the jig for modern audiences: Skeaping has run workshops on jigs with the Royal Shakespeare Company, performed broadside ballads and jigs with her band City Waites, and produced a CD, The English Stage Jig (2009). Clegg has written a doctoral thesis on the jig and has worked on the staging of jigs at Shakespeare’s Globe and the University of Exeter. This is an exemplary exercise in collaboration. It is also one that is demanded by the form, since the jig was the most hybrid kind of theatrical performance in a theatre where the mainstream plays were themselves notably hybrid. The stage jig derives from a combination of popular song (the ballad), dance (the stepping of morris men) and folk drama (the mummers’ plays). The central performer is the clown, with the role of jig-master defined first by the immensely popular Richard Tarlton from the 1570s onwards, and then by Will Kemp, Shakespeare’s clown until 1599 and arguably the first celebrity as a result of his famous dance to Norwich. As the form expanded from its origins in the ballad into a rudimentary form of drama, it drew upon both native story motifs (Robin Hood) and continental material (tales from Boccaccio, the commedia dell’arte, and the French soties). But it also allowed for the jig to become a form of libel as generic tales of adultery and other sexual misdemeanours were adapted for particular circumstances and identifiable subjects (the word ‘jig’ itself has strong sexual connotations). This inevitably brought it into conflict with city authorities who had it suppressed at various points. However, the other aspect of the form that was felt to be threatening was one that, interestingly, kept it on the very margins of what we might see as commercialised or commodified popular culture. As the editors point out, vagrants and others who couldn’t afford the admission price often forced their way into the theatres for the jig at the end of the performance. This last phenomenon returns the jig to something like a communal social practice, but only in a context which reconstructs the participants as a threatening urban crowd. The jigs collected here include The Black Man, in which a rustic clown called Thumpkin pursues a barmaid, only to have her snatched from him by a pair of gentleman thugs. He then manages to get her back by posing as an elderly parent. In The Jig of Denys’ Ghost a girl is wooed by a cobbler and a carter, and after she rejects the cobbler he decides to return as the ghost of St Denys in order to frighten the couple. The situation is echoed in Donne’s poem, ‘The Apparition’. The more ad hominem kind of satire is represented by The Libel of Michael Steel, which was written to expose a Yorkshireman’s affair with his maidservant. For a modern analogy with the jig, we might imagine a cartoon—Tom and Jerry perhaps—following the main feature. And making such an analogy highlights what is perhaps the oddest feature of the early modern jig, which is the fact that it was an afterpiece, not a prelude. There are many references to the jig coming at the end of the performance, as Clegg and Skeaping note, but this may not have been the unvarying practice. One of the most famous references to the form is Marlowe’s ‘From jigging veins of rhyming mother wits/We'll lead you to the stately tent of war’ in the prologue to Tamburlaine, which is always interpreted as a reference to the offerings of rival dramatists. Yet the most obvious explanation of the lines is that they refer to what the audience has just seen. This and other questions about the relationship of the jig to the mainstream dramatic genres which they accompanied will surely be reopened by this volume. 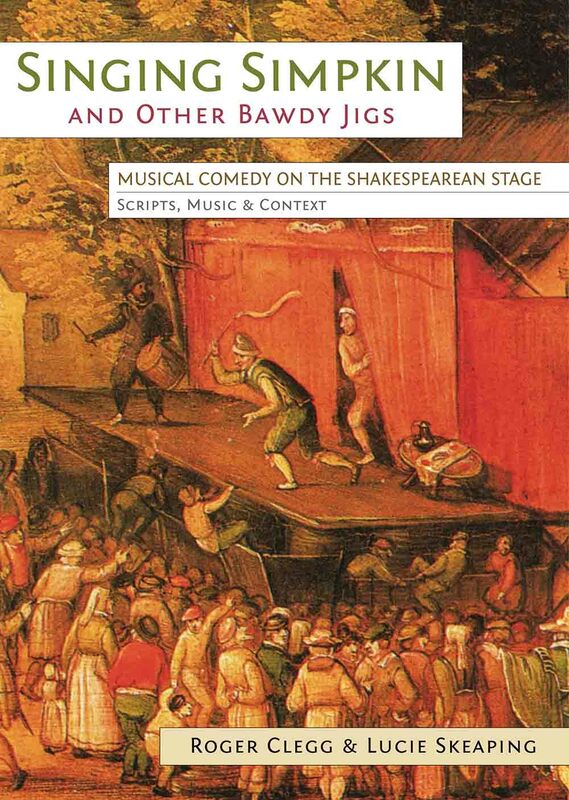 This is an excellent piece of research and a valuable resource for anyone wishing to study the history of performance, the popular cultural forms of the early modern period, or the repertoire of the playing companies in the first age of the English professional stage. Baskervill, C.R., 1929. The Elizabethan jig and related song drama. Imprint 1965. New York, NY: Dover. The City Waites and Skeaping, L., 2009. The English stage jig. [CD] London: Hyperion Records. Neil Rhodes is Professor of English Literature and Cultural History at the University of St Andrews and Visiting Professor at the University of Granada. He is co-General Editor of the MHRA Tudor and Stuart Translations for which he has contributed the volume English Renaissance Translation Theory (2013). His other publications include Shakespeare and the Origins of English (Oxford, 2004), and his first book, Elizabethan Grotesque, was reissued by Routledge in 2014. From 2014–2016 he holds a Leverhulme Research Fellowship to work on a book entitled Common: The Development of Literary Culture in Sixteenth-Century England.